Remember that nothing is sacrosanct and things keep changing over time. 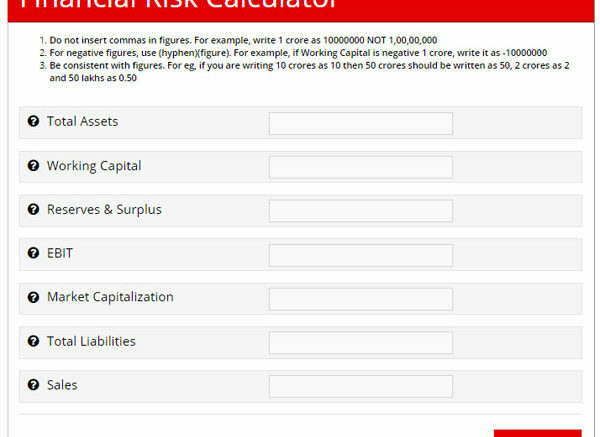 The Financial Risk Calculator is based on Altman’s Z-Score. The score does not hold good for turnaround companies, and it may even represent a skewed picture for established companies. ALSO: This article is not valid for turnaround companies. However, each line item of the Score has a story to tell, and here is how you should extrapolate one item with the other to interpret the story. a. The management does not know how to deploy its cash. b. The company holds excess and possibly obsolete inventory. c. The company may have loads of bad debts that are reported in the receivables. Also, a very low working capital to total assets ratio need not be a negative. It can imply that the company enjoys extended credit facilities from its suppliers. When a company has low reserves, it can only expand or maybe even fulfill working capital requirements by borrowing more. Sch companies can avoided because any disruption in the market or the entry of stronger competitors can destabilized business. This is like the return on assets ratio. Think about it, if you have made a FD, you can easily make up to 7% in interest. Likewise, you can ratio to figure out whether the company is returning a healthy return. If the company’s rate of return on its assets is sub par or below its peers, you can junk it and switch over to a better stock. This gives us a ratio of 1.95 when PCJ is at 193. When PC Jewellers fell to 98 bucks, this ratio would have been reduced to 1.00. Now think what will happen if there is a run on PC Jewelers’ shares. It’s non current assets are just 558 crores and its current assets are a whopping 6900 crores. If there is a run on the share, the liabilities will outstrip market capitalization, creditors will start knocking for payments while debtors may do the vanishing act. Long story short, avoid companies that have a low Mcap to Total Liabilities ratio. These notes will help you fine tune your understanding of the Financial Risk Calculator. Be the first to comment on "Financial Risk Calculator Add On Notes"